As you might have noticed from the ring we have chosen to be the focal point of our Home Page (style RL639D32Q at $2513.00) we are very proud of our Natural Gold and Gold Quartz Jewelry. Part of the value of all treasures is their rarity, but this is one of the rarest. And one of the most beautiful. And used in its natural state. 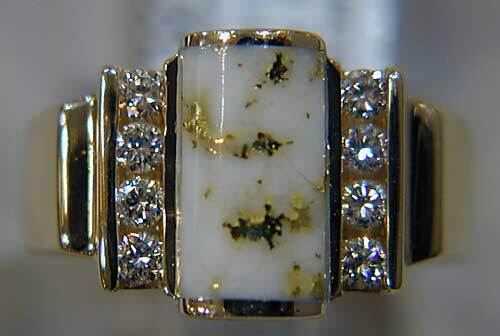 Gold Quartz gemstones with the white body background and the quality which we use in our jewelry is even rarer. It comes only from one mine in the Sierra Nevada Mountains of California. To own one of these creations is to own a piece of natural beauty unsurpassed, and because each is blessed with its own unique pattern of gold in the quartz, each is unique. The Natural Gold Nuggets are from placer deposits in stream beds. 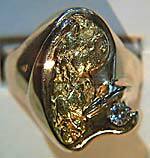 It is native gold which has been eroded out of the veins in which it was formed millions of years ago. We use it in its natural shape and create our jewelry around it. This makes each piece unique...and very, very lovely.